Wed, Feb 13, 2019, 10:06 pm SL Time, ColomboPage News Desk, Sri Lanka. 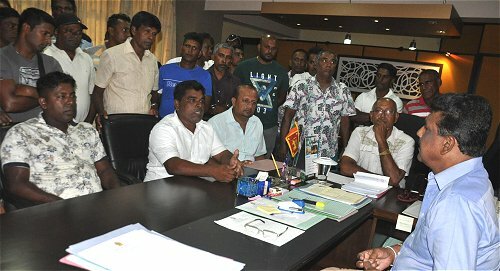 Feb 13, Colombo: A special discussion was held with the State Minister of Fisheries and Aquatic Resources Development Dilip Wedaarachchi on Wednesday (February 13) regarding the problems faced by multi-day trawler owners due to the use of fishing boats for human smuggling. About 50 multi-day fishing trawler owners and fishermen attended the discussion held at the Ministry of Fisheries and Aquatic Resources Development. Multi-day fishing trawler owners said the human smuggling using fishing boats raises major issues for the country as well as for the entire fisheries industry and brings immense disrepute to the country. The multi-day trawler owners and several other members of the fishery industry said they suspect that there is an unscrupulous hand behind the human smuggling operation since the smugglers manage to avoid intelligence units and security forces and operate without hindrance and requested the government to immediately intervene and take steps to control the smuggling racket. The State Minister said that if needed to control the situation, as a government considering the well-being and future of the fisher community as well as the country, the government will resort to severe punishments, introduce new laws and implement the law strictly. Accordingly, the State Minister Dilip Wedaarachchi decided to promptly call a meeting with the officials of the Attorney General's Department, Ministry of External Affairs, Sri Lanka Police, the Navy, other responsible agencies and the Fisheries Department and take necessary steps. The Minister also invited the owners of the multi-day fishing trawlers for the discussion.